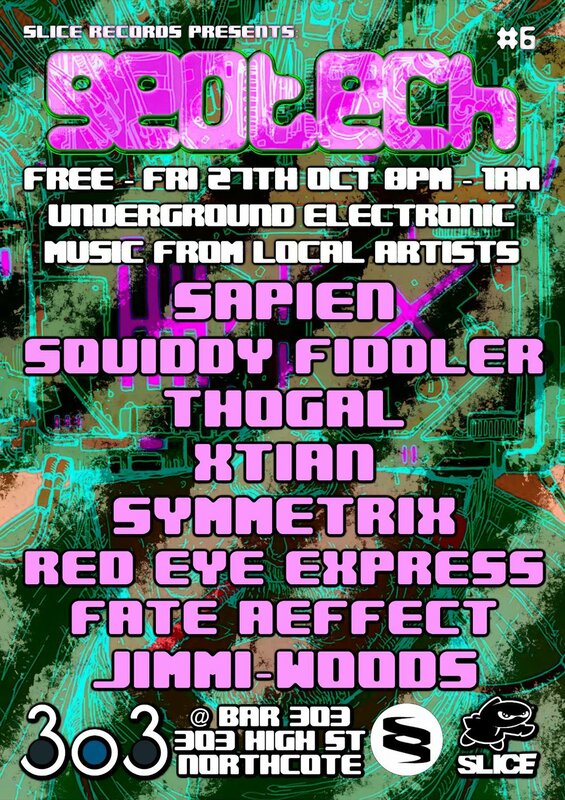 Geotech is a monthly night at Bar 303 featuring Underground Electronic Music from local artists. This installment showcases an ecletic mix of original and diverse styles not adhereing to any specific genre or scene! Sapien is a story teller, combining elements of the ancient past, the living present and the technological future, carefully constructed into frequencies that resonate on a level that transcends language, and is left to each person to interpret in a way that is unique to their own self in that specific moment of time. In the last 10 years Xtian has been continuously collaborating with other artists, producing, mixing, djing and publishing music online. Xtian's sounds are phat, creamy and chunky, an overall electronic style with funk, psy, tech and classic influences. Symmetrix formed in Melbourne, in 2013 with the vision of creating a sound that would combine both her love of electronica with indie pop and a bit of rock music thrown in for good measure. Symmetix music draws influence from 80’s inspired synth/electro pop with layered samples, laptop, beats and guitars. Sharing a back ground in rock music and electronic music, Red Eye Express is a fusion of their influences, with the production nous of ARIA award winning producer Simon Polinski and augumented by the programming skills of Christopher Innes & John Crombie (from The Omm Squad) and the dexterity of multi-instrumentalist Rob McPherson (AKA Garagee). Experimental electronic musician who could be considered a genre crosser who underpins his sound with tech infused grooves.